Advanced UAV aerodynamics, flight stability and control: Novel concepts, theory and applications presents emerging aerospace technologies in the rapidly growing field of unmanned aircraft engineering. Leading scientists, researchers and inventors describe the findings and innovations accomplished in current research programs and industry applications throughout the world. Topics included cover a wide range of new aerodynamics concepts and their applications for real world fixed-wing (airplanes), rotary wing (helicopter) and quad-rotor aircraft. The book begins with two introductory chapters that address fundamental principles of aerodynamics and flight stability and form a knowledge base for the student of Aerospace Engineering. The book then covers aerodynamics of fixed wing, rotary wing and hybrid unmanned aircraft, before introducing aspects of aircraft flight stability and control. Sound technical level and inclusion of high-quality experimental and numerical data. 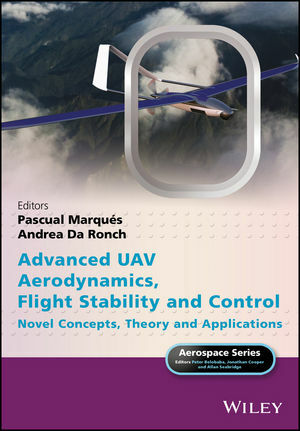 Direct application of the aerodynamic technologies and flight stability and control principles described in the book in the development of real-world novel unmanned aircraft concepts. Written by world-class academics, engineers, researchers and inventors from prestigious institutions and industry. The book provides up-to-date information in the field of Aerospace Engineering for university students and lecturers, aerodynamics researchers, aerospace engineers, aircraft designers and manufacturers. Dr. Pascual Marqués, President of Marques Aviation Ltd., UK holds an MPhil and a PhD degree in Engineering Mechanics. At Marques Aviation, Dr. Marqués oversees the design, R&D, and manufacturing of the MA THOR unmanned aircraft series. His research interests lie in the fields of Aerodynamics at low Reynolds numbers and Flight Stability. His research projects involve the implementation of theoretical aerodynamics. Wing aerodynamic efficiency in UAVs is optimized by adjustment of wing planform and Oswald efficiency, incorporation of flow control devices, modification of tip vortex configuration, and application of optimized geometric and/or aerodynamic twist. Flight stability is enhanced using principles of aeroelasticity, adaptive wing technology, and automated flight control. Dr. Marqués is the Editor-in-Chief of the International Journal of Unmanned Systems Engineering, and Chair of the World Congress on Unmanned Systems Engineering and the International Aerospace Engineering Conference. Alongside the academic position at the University of Southampton, Dr Andrea Da Ronch is seconded to Airbus Operations Ltd through a Royal Academic of Engineering grant. He is also a visiting academic at Beihang University (Beijing, China) and at Pontif? ?cia Universidade Católica do Rio Grande do Sul (Porto Alegre, Brazil). His research interests are in CFD methods for aeroelasticity and flight dynamics, and in the development of nonlinear model reduction techniques for large computational models. The impact of his research activities has a significant international visibility within the aeroelastic and aircraft design communities, reflecting his key role in the development of a number of software tools. The initial involvement with the "Next generation Conceptual Aero-Structural Sizing" (NeoCASS) has now been superseded by an active role in the development of the "Computerised Environment for Aircraft Synthesis and Integrated Optimisation Methods" (CEASIOM) software, considered as one of the world's most advanced tools for multi-fidelity integrated aircraft design.